Special Features: Map-defined features e.g. ceiling colors, music. Initial impressions: The first level immediately illustrates that having the ability to change the ceiling colors can massively improve a graphics set. 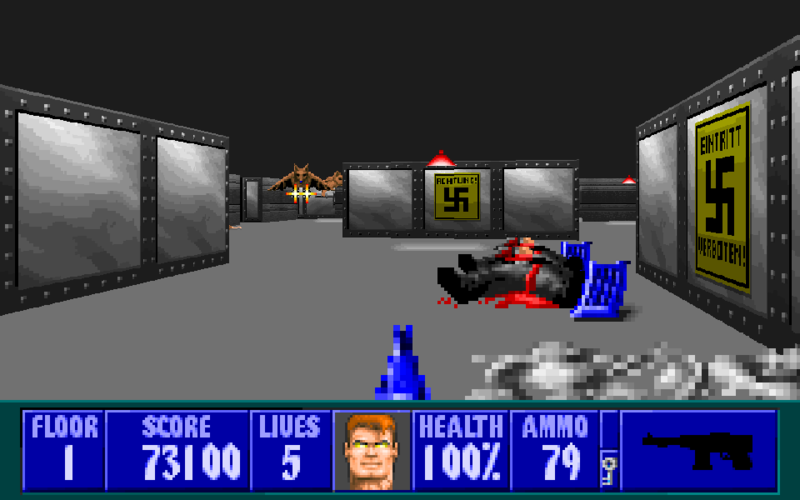 After all, one of the most often heard criticisms of the Lost Episodes is that their graphics aren't as varied and interesting as the graphics of the original Wolf3D, and that they do not match well with the ceiling colors used in the game (which are the ceiling colors of the original SoD). Thomas' level illustrates the potential of the LE-graphics, and how much difference changing the floor/ceiling colors makes. Gameplay: This mod plays just like the original, so there is no learning curve for anyone who has played the original. The only thing that varies is the difficulty, ranging from normal to very difficult. But it is this variety that makes this set special, as the levels range from the sober and grey to the wonderfully colorful. It really sheds new light on the LE-graphics, and I love how some of the mappers have taken the opportunity to use the colorfulness in their maps. It makes this set feel vibrant, and really sets it apart from other community-created sets. Mapping: A community set like this relies on the quality of its maps, and overall I would say that the mapping is this one is really good. As mentioned before, I love how some of the mappers highlighted the colorfulness of the graphics set, and it's one of the main things that sets this set apart. This is accentuated by the varied use of floor/ceiling colors. Used so uninspiringly in the original, here the ceiling colors make the set feel more vibrant and visually interesting. I especially want to highlight Serpens' maps, which for me were the highlight in terms of wall variety and use of interesting ceiling colors. But really, overall the mapping ranged from good to great. To only dissident was level 9, and even that level was challenging and interestingly weird in its own way. If the other levels are mainstream, then this one would be called Avant-Garde. Likes: The variety of mappers is a plus, with very few lapses in terms of quality. I really enjoy that most of the mappers employed the colorful aspects of the graphics, really showing the potential of the LE graphics (which are often seen as 'ugly'). I'm often a big fan of changed ceiling colors, and I think this one really uses it well. I also liked the order of the levels, which struck a good balance in terms of difficulty. Dislikes: For me, there was not a lot to dislike. 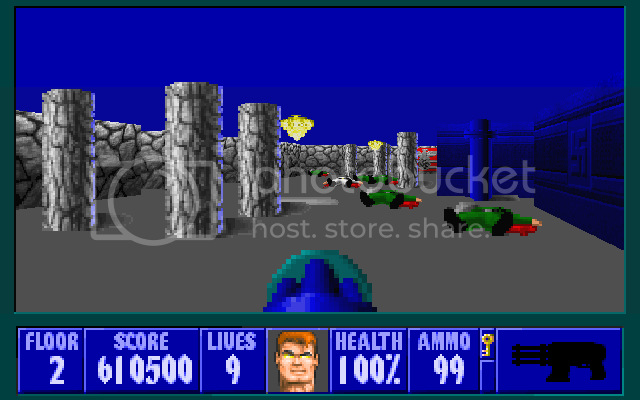 There was only one level that was a bit lower in quality, and even that one I didn't really mind. The only dislike I can think of that some levels were a bit too 'normal', but that's just grasping straws. Wrap-up: This community set might just be the best community set yet released. The mapping standard is great throughout, and the colorfulness is an aspect that is not often brough to the foreground in such a set. It is varied, vibrant and surprising, and I wholeheartedly recommend it. It's a good set and a good review, but I have a question about the screenshots. By the ceiling colors you are showing 3 different levels all as Floor 1, and none of them are the actual Floor 1 of the set. Similarly, your Floor 2 shot can't be the actual Floor 2; again it has the wrong ceiling color. What's the reason all the shots ended up with a different floor number than what the actual set has, including three different levels all shown as Floor 1? It isn't a big deal, but I would appreciate knowing what happened. I have just grabbed the screenshots from the DHW forum, meaning that these shots were made by the authors of the various levels. Hence they all have the wrong floor number displayed, but it's a good way to prevent spoilers I guess. Aargh. I am not a fan myself of mine own level 9, I have to confess the inspiration was not with me... But against all this, I tried to reflect some challenging ideas. Thanks for the review Ron, it is always good to see good articles in your blog. I might add, that the wrong level number on screnshots is probably due to the fact that every mapper maps on level 1 of the DHW Kit mapset, in local. ^^That's true, I do the same thing myself as well :) Thanks for your comment.